We recommend using our Exterior Finish for all outside siding, decks and exposed timbers because it is easy to use, repair, maintain and looks great without any flaking or cracking. Our Exterior Finish works especially well with hardwoods such as Black Locust, Epay and other dense woods which are longer lasting in tough outdoor conditions. Our Exterior Finish protects wood from the inside out with high quality oils and resin and he UVA added helps slow the natural greying process for exposed woods. Our Exterior Finish is clear and dries to a matte sheen, showing off your wood’s natural brilliance. Our Exterior Finish is simply our Original Finish with both a Mildewcide and UVA blocker added for extra protection in the elements. If you live in a very dry climate, you may not need the Mildewcide and so can ask to order just Original Finish with UVA added. We also have people use the Original Finish outside who want to avoid using chemicals or who want the wood to go grey sooner. Keeping the wood oiled is the best protection over time and will help whatever wood you choose, age with beauty and grace. Application: Shake or stir your Exterior Finish well before each use. Try to avoid application in direct sunlight or rain. Test our product first on a small test surface to make sure you like it. In some applications, such as a log home, initial treatment with a borate salt solution should be considered for long-term protection against mold, insects, and sap stain, as well as "breaking" the mill glaze (break the "mill glaze" by lightly sanding the surface first to increase penetration). Apply to woodwork of any type, using a real lambswool applicator, pump-up or airless sprayer, oil brush, or cotton rag. We do not recommend application with a paint roller, however many of our customers have been using high quality lambswool, short nap rollers and had great success. On logs and timbers, fill all checks and cracks with the product. This will greatly reduce further checking, even on freshly sawn species such as oak. Clean the wood surface and using a wet-on-wet technique (which means the coats don't have to be dry between applications), apply only as much finish as the wood will absorb in a day and then buff off excess or any pooled up oil as needed to avoid tackiness and a glossy look in certain areas. For a log or timber frame home exterior, apply 2 to 4 wet-on-wet coats, applying the final coat(s) in 3-4 months. The oiled surface should feel dry to the touch the first week but the finish will reach it’s final curing and hardening process in 3 to 4 weeks time. Re-coat every year for best protection, especially on the south exposed side. However, we have many customers that can go easily a few years before re-coating, so determine when you need another coat by how dry and faded the surface looks. Wet sand or power buff for a furniture-grade finish using our Liquid Wax End Sealer as a top coat if desired. Exterior Finish may be thickened with Concentrated Finishing Oil or Liquid Wax or thinned with Pure Citrus Solvent for easier penetration if needed depending on the unique requirements of the species of wood you are using. Heritage Natural Finishes are very durable and easy to maintain. You can repair areas by rubbing in more finish to abrasions, scuffs and scratches with an abrasive pad the buff out. The easy nature of our finishes prevents most problems other finishes have with air bubbles and lap marks. DO NOT apply our finishes over the top of other products or finishes since you want the oils to penetrate deeply into the wood. The wood should ideally be bare, free of dust and dirt, and untreated. We are happy to send you a sample of our finish for you to try it, just let us know! Please give us a call if you have any further questions at (541) 844-8748. Thank you! Photo credit: Photo and barn by Colin Buell of Timeless Timberworks. 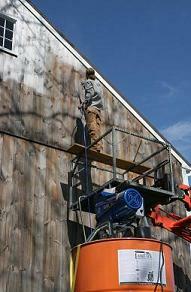 Applying the first coat of Heritage Natural Finishes Exterior Finish on a barn he built in New York. Used with permission.